Pitt Plays The American Patriarch In 'Tree Of Life' Brad Pitt has played a police detective, a mental patient, the outlaw Jesse James and a cutthroat Nazi hunter. 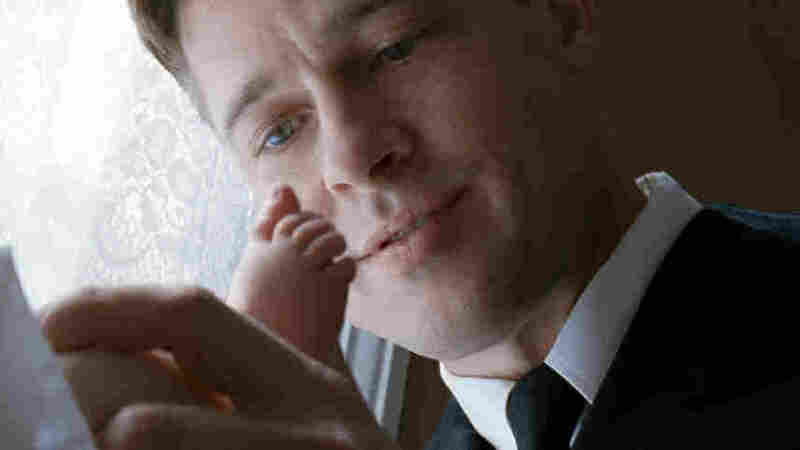 But critics are already calling Pitt's latest part, in Terrence Malick's The Tree of Life, a career-defining performance. Brad Pitt plays Mr.O'Brien, an archetypal 1950s patriarch who loves his family and can't help but imposes huge expectations on them. Over the span of his career, Brad Pitt has played a police detective, a mental patient, the Greek warrior Achilles, the outlaw Jesse James and a cutthroat Nazi hunter. But in his latest film, The Tree of Life, he does something completely different — though it may not seem that way at first. Pitt plays Mr. O'Brien, a husband and father struggling to raise three boys in 1950s small-town Texas. The film's intimate family portrait is scattered with cosmic images of nature and strays from traditional linear storytelling. It won the top honor at this year's Cannes Film Festival, and many critics are already calling it the performance of Pitt's career. Pitt tells NPR's Rachel Martin how director Terrence Malick first explained the film to him. "He described the journey from adolescence to adulthood as that between grace and nature," Pitt says. "In the film ... the mother represents grace and love, and the father represents nature — but nature as that oppressive force that will choke another plant out for its own survival." Pitt's character is an archetypal 1950s patriarch: He's strict and while he does express love for his family, he also has a frightening temper. Pitt says growing up in the rural Midwest helped him understand the film's "father knows best" mentality, as well as where his character was coming from. Filmmakers use hand-held cameras to capture the scenes of Terrence Malick's The Tree of Life, starring Brad Pitt and Jessica Chastain. "The character here in The Tree of Life is someone who feels most oppressed by the world," Pitt says. "The American dream didn't work out as he believed it would. [He's] quite envious and bitter that people are ahead of him. Naturally, when someone feels oppressed, they find someone weaker to pass that oppression on[to], and the sadness in this situation [is] it's on his sons." The film's suburban landscapes were filmed in Smithville, Texas, 40 miles outside of Austin. Pitt describes it as a time capsule of 1950s suburban America and says Malick's movie set was unlike anything he'd ever worked on before. "A movie set is very chaotic. There [are] hundreds of people; there [are] generators and trucks. And this was a completely different experience — we had none of that," Pitt says. "There were no [camera] lights ... there were no generators and the camera was all hand-held so it was a very free-form, low-key experience." So low-key, in fact, that Pitt says much of the filmmaking environment resonated with his own rural Midwestern childhood — playing outside with the kid actors, throwing the ball around between takes. "Staying up late till the sun went down, hearing your mom's voice call you in, getting into trouble breaking windows, firecrackers, playing in cemeteries," Pitt says. "I could feel the balm in the air of the summer nights — and yes, it's very close to me." Malick is a bit of an anomaly in Hollywood — he's made five movies over the past 40 years and rarely gives interviews — and according to Pitt, his filmmaking style is just as exceptional. "Terry [Malick] is all free-form. He's someone who's looking for moments of truth ... not [to] create moments of truth," Pitt says. "If Jessica [Chastain] and I were having a fight in the first take, he would suddenly send the youngest child in to sit down at the table, and it would change the whole tenor of the scene. He would throw a dog up in the front seat and laugh. He's just constantly trying to push people off their comfort zones." The result is a complex film with more than just one takeaway. And while many have latched onto the film's theological implications, Pitt says he's more drawn to its emphasis on life's unanswerable questions. "For [me], it speaks to the unknown," he says. "Maybe the real peace to be found is in the acceptance of the unknowing; that we don't know, but that there is something; that there's a real power there that's greater than us. And maybe that's enough."